Congratulations as you ready yourselves for the Sacrament of Marriage. 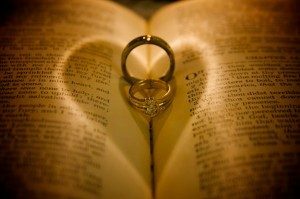 It is within this Sacrament that two people become one, enter into a permanent relationship that is ordered toward the beauty of life. Contact the parish office a minimum of six months prior to your selected date. The office will ask the date of your wedding. However, no wedding date is final until a meeting is conducted with one of the priests. Complete a FOCCUS (Facilitating Open Couple Communication, Understanding and Study) marriage preparation inventory. Meet with a FOCCUS couple to discuss the results. Attend a Pre-Cana or Engaged Encounter weekend (vary from one to two days) as a couple. Meet with our liturgist to plan wedding details. Meet with one of the priests to finalize paperwork (includes providing baptismal certificates and completing the Form I). Please note: Weddings on Saturday can be scheduled no later than 3:00 p.m.
Again congratulations on this beautiful journey!